Several of Ayatu's wives engage in a discussion about health issues and family planning. ARSI, Ethiopia — If you were to visit 65-year-old Ayatu Nure and his family at their compound in the Oromiya region of Ethiopia, you would probably find eight of Ayatu’s 12 wives working well together as they harvest banana roots for dinner, or share in the raising of their 78 children. Most of the children are under 10 years of age and need tending, and so their older siblings baby-sit while their mothers work in the field and their father tends to the cows in the meadow. In this remote, densely-populated region of Ethiopia, it’s common for men to have four wives-as long as they can provide for them and their children equally--but in Ayatu’s case this backfired. Years ago, Ayatu had enough land and food to satisfy everyone’s needs. This changed when Ayatu had to sell land or cattle to make the dowry payment for each new wife he took, usually a sum of between $500 and $1,000. Ayatu had enough land and food to satisfy everyone’s needs but now his shrunken land is bare from overgrazing and he can no longer afford to feed his children. Now, Ayatu is paying the price: poverty. The family compound is almost bare from overgrazing, two of his wives have moved with cattle in search of greener pastures, and two others died from unknown illnesses in the 1990s. Ayatu’s first wife, Ende, has joined their eldest son on his property where she has her own home and is raising her biological children. The two married when they were both fifteen and she says she is not bitter over her husband’s decision to take so many wives-despite the economic suffering it has caused, “I loved him, I married him. I had his children. Why should I hate him now?” says Ende. The situation is so desperate that Ayatu cannot afford to send his children to secondary school, which is miles away and costs about $1,300 per student. He is marrying off two of his 15-year-old daughters to ensure they are fed. Thirteen others are living with their married siblings. Ayatu said that when he thinks about not being able to send his children to school he wants to commit suicide. “I feel guilty when I see my children without clothes and they don’t have enough to eat. If there is a plate full or food, it’s not enough for all of them,” said Ayatu. 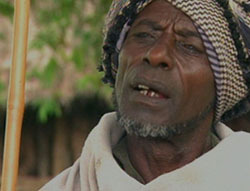 Living with two wives and eight children in a neighbouring town is Ayatu’s eldest son, Dagne. Here, Dagne rotates every two days with each wife. He says both are happy with this arrangement. Yet, Dagne was reluctant to marry at first and only agreed to take on two wives because his father insisted. Dagne said they both made mistakes by taking more than one wife and blames it on a lack of education, “Men and women don’t have the knowledge of birth spacing or the desire to seek this information,” said Dagne. 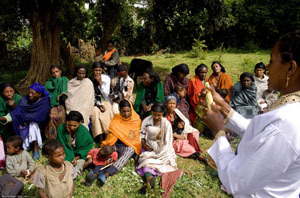 To assist families like these, the Government of Ethiopia launched a network of 29,000 health extension workers who teach both men and women about basic hygiene and family planning and provide contraceptives to those who want to delay childbearing. So far, two of Ayatu’s wives are using long-term implants. Many women in remote villages opt for this method because of the distance between their homes and health centres. Ayatu admits he failed to acknowledge the consequences of having such a large family, and wants to be a role model for young people so they will not make the same mistake. He has become an advocate within his community and speaks openly about the troubles he has faced as a result of his choices. Most of Ayatu’s wives are using some form of contraception now-yet there are still some challenges as his youngest child is 10 months old. Health extension workers visiting families in this pastoral landscape also face difficulties as they have to walk long distances to reach one household. Each woman should be offered a choice of family planning options, and sometimes stocks to meet the demand of many communities. About one third of all maternal deaths each year could be averted if women had access to reliable family planning methods. 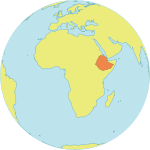 To improve the quality of life and maternal health of families in Ethiopia, UNFPA, in collaboration with the Government of Ethiopia, is determined to implement a primary health-care plan by 2010. In addition to providing clinics and hospitals with free contraceptives and medications, the plan is also pushing for an increase in family planning and contraceptives. UNFPA and its partners have given $25 million to the Government to meet its contraceptive needs in support of maternal health.